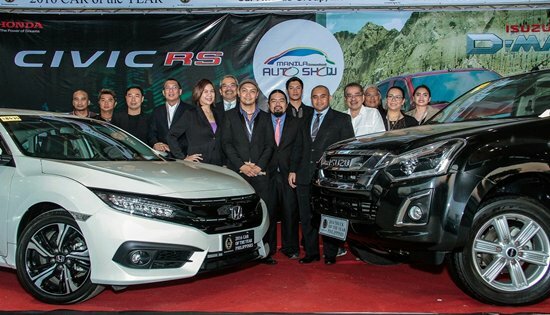 MANILA – To start the ball rolling for the new 2017 season, the Car Awards Group, Inc. (CAGI) held their momentous launch events at the Manila International Auto Show (MIAS) at the World Trade Center in Pasay City last March 31, 2017. With the continuous vision of keeping the Filipino consumer informed of the best cars for sale in the market, CAGI not only kick started the rigorous search for the best vehicles contending in the Car of the Year Philippines (COTY-P) and Truck of the Year Philippines (TOTY-P) awards, but also opened the doors to the world of two-wheelers with the inauguration of the Motorcycle of the Year Philippines (MOTY-P). “By welcoming new blood into our fold, the organization is expanding its reach, and tapping into the expertise of the motorcycle media to adapt our successful model,” said CAGI president Ronald de los Reyes during a speech. "We believe that it's about time that we also give due recognition to our fellow two-wheeled contemporaries on the road," he added. Special guests representing various sectors of government graced the launching ceremonies, such as Department of Tourism assistant secretary Inaki Jose and Department of Public Works and Highways undersecretary Atty. Karen Jimeno. "The state of our country's infrastructure affects our car preferences,” Jimeno mentioned in her speech as she related the event to current local issues. Since 2004, CAGI prides itself of holding annual test fests, where all vehicle entries go through a strict process of classification and sorting, before they are subjected to qualitative (consumer) and quantitative (performance) testing. Qualitative testing uses predetermined consumer metrics like the ride, fit, and feel, while quantitative testing uses GPS-based hardware to measure handling, braking and acceleration. Each year, winners for each category are announced, and from that winning pool emerges the year’s COTY-P, TOTY-P and this time, the MOTY-P.
“We expect more than a 100 motor vehicles consisting of cars, pickups and motorcycles to be tested this season,” de los Reyes shared. Aside from the official launch in MIAS, the usual Test Fest in September and October; and the awards night in November, this year’s season will include various dealer talks in April and May, test demonstrations in June and July, and the television special in December – thus further adding more excitement to the jam-packed season. For the third straight year, www.Carmudi.com.ph presents this endeavor while internationally respected auditing firm KPMG is once again on-board as partner. The latter will be in-charge of all the data handling during the testing process, which consists of data gathering, tabulation, and up to the final audit and release of the official results. Car Awards Group, Inc. is comprised of members from the following media entities: Business Mirror, Cebu Daily News, Daily Tribune, Malaya Business Insight, Manila Bulletin, Philippine Daily Inquirer, Philippine Star, The Manila Times, Bulgar, Abante Tonite, Mindanao Daily News, AQ Magazine, Autocar.Ph, C! Magazine, Motorcycle Magazine, Power Wheels Magazine, Top Gear Philippines, 2nerMagazine.com, Carmudi Magazine, Iginition.ph, Interaksyon.com, Kotse.com, ManilaSpeak.com, MotionCars.com, Ride and Drive Phils., Speed by MP Turbo, SprocketPh.com, TessDrive.com, TimeAttackManila.com, Yugatech.com, DZMM, Inside Motoring on DZRJ 810 AM, Mellow 94.7, Motoring sa DZME, The Motoring Page on Mellow 94.7 FM, ABS-CBN, Auto Review, Spotlight TV. MAKATI CITY – Department of Trade and Industry (DTI) Secretary Ramon Lopez recently (April 5) convened the National Price Coordinating Council (NPCC) to closely evaluate the price and supply situation of basic necessities and prime commodities during the first quarter of this year. The NPCC will work with DTI on analyzing the industry structure and streamlining the process of price regulation to create a more efficient and effective system for both manufacturers and consumers. DTI would also be working with the Philippine Competition Commission (PCC) to continuously review the industries' structure, and the play of competitive forces, that will ensure optimum competition and best options for quality products/services and affordable price points for consumers. CALBAYOG CITY – The Department of Public Works and Highways (DPWH) Samar First District Engineering Office (SFDEO) proposes a total amount of P302,932,000.000 for four (4) tourism projects under its jurisdiction for the year 2018 under the DPWH-DOT Convergence program. A project cost amounting to P200 Million is proposed for the Improvement/Construction of 5.660 kilometers Portland Cement Concrete Pavement (PCCP) with 6.1 meters width and 230 mm. thickness of Sto. Niño Circumferential Road, Sto. Niño, Samar. Some P30 Million is proposed for the concreting of 900.0 linear meters PCCP with 3.0 meters half lane width and 230 mm thickness, Access Road from Brgy. Rizal II leading to Mapaso Hotspring, Oquendo District, Calbayog City, Samar. Meanwhile, some P50 Million, is proposed for the concreting of 1450.0 linear meters PCCP with 3.0 meters half lane width and 230 mm thickness of the Access Road from Brgy. Lungsob leading to Guinogoan Cave, Calbayog City, Samar. The proposed project cost for the concreting of 1000 linear meters road with 6.00 meters width and 230 mm thickness is P22.932 million of the Access Road from Brgy. Caglanipao Sur leading to Busay Falls, Brgy. Caglanipao, Tinambacan District, Calbayog City, Samar. SFDEO submitted the pertinent documents for the possible approval of the proposed projects by the Department of Tourism. Approval of the said proposed projects signifies increase of domestic and foreign tourists visiting the said tourist attractions in Calbayog and the booming of economic activities of the locals in the concerned villages. 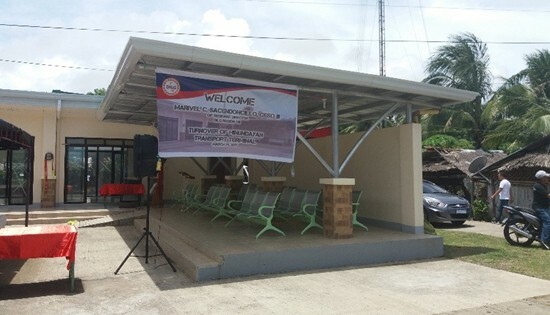 HINUNDAYAN, Southern Leyte – The Department of the Interior and Local Government (DILG) turned over on March 29, 2017 the completed P3M-worth Transport Terminal to the Municipal Government of Hinundayan. The Turn-Over Ceremony was kicked off with a blessing officiated by Rev. Fr. Ricarte Olayvar, followed by the ceremonial ribbon cutting. Gracing the event was the DILG RO 8’s PDMU Head, Engr. Ofelia M. Pido, along with DILG Southern Leyte OIC-Provincial Director, Jesus P. Naquila, and Cluster Head, Geraldine C. Maquelabit. Funded thru DILG’s Bottom Up-Budgeting (BUB) Program, the multi-million-peso project was also made possible thru the commendable efforts of MLGOO Edgar S. Bayano and under the dynamic leadership of Mayor Alfredo M. Lagumbay and Vice Mayor Elisa C. Cadingan. In his speech, PD Jesus P. Naquila, encouraged the CSOs to continue their active participation in the monitoring of all government projects, not just the DILG’s. Meanwhile, Engr. Pido expressed her great joy as well as her high hopes for the completed project to spur more economic activities in Hinundayan. In attendance also were the local functionaries of LGU Hinundayan as well as the active Civil Society Organizations. QUEZON CITY – The Bureau of Internal Revenue (BIR) owes each 600,000 minimum-waged workers nationwide with an estimated P9,000 “blood money” from the tax they collected for six months in 2008 amid a law exempting the workers from withholding tax, labor group Associated Labor Unions-Trade Union Congress of the Philippines (ALU-TUCP) said yesterday. In its decision released on February this year, the Supreme Court said minimum wage earners (MWEs) should not taxed because they are exempted from doing so by Republic Act 9502 – the law giving exemption to minimum waged workers from monthly salary tax deductions. The law became effective June 17, 2008. However, the BIR issued Revenue Regulation 10-2008 and only exempted MWEs six months later. The TUCP filed a contesting petition at the SC nullifying the regulation as contrary to the law. It is estimated the BIR collected an average P792 a month for six months from each MWEs at that time but the BIR should also be charged with 12% legal interest fees for nine years, said Alan Tanjusay, spokesperson of ALU-TUCP. “This is a subtle form of injustice done by BIR for minimum-waged workers who depended on their daily pay to make both ends meet. The amount of money the BIR collected is blood money that could have been spent to buy food, pay for tuition fees and purchase medicines,” Tanjusay said. He said the ALU-TUCP is urging the SC to hasten the specific implementing rules and regulations that lay the mechanism for the actual refund. “We suggest the cash refund should be coursed through the employers if the employers are still existing. If the company has shut down, we suggest the refund should be disbursed through BIR regional offices,” Tanjusay said. Refund by means of tax credit is more problematic because most of minimum-waged earners at that may have become unemployed or remained at the same minimum waged level and so they are still tax-exempt, Tanjusay added. 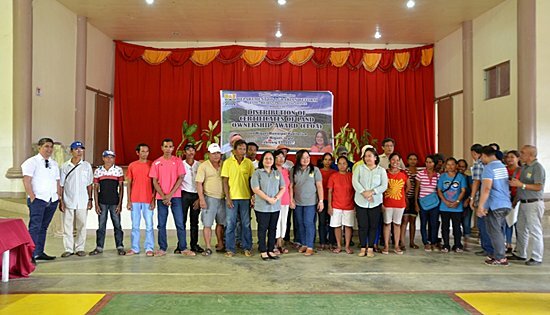 SAN MIGUEL, Leyte – After over 20 years of waiting the 84 agrarian reform beneficiaries (ARBs) here were finally installed by the Department of Agrarian Reform (DAR) to their awarded lots within the Leyte Sab-a Basin Development Authority. In 1991, DAR handed a collective certificate of landownership award (CLOA) numbered OC-4, covering Lot 1578 in Barangay Capilihan to the beneficiaries under the Comprehensive Agrarian Reform Program (CARP) but failed to install them due to harassment by other farmers in the area. Leyte Provincial Agrarian Reform Program Officer Renato Badilla who issued the writ of installation disclosed during the ceremonial installation that the area measures 207 hectares. In September last year, DAR conducted the subdivision survey and revalidation of ARBs to check if those mentioned in the CLOA are still around. Remegia Labaclado, one of the ARBs installed, wished in her message that the individual CLOAs be released to them soon. She also said that they will immediately till the land and make it productive after having been deprived for two decades. Meanwhile, Regional Director Sheila Enciso directed DAR’s Program Beneficiaries Development Division to discuss with the ARBs appropriate projects that would help increase the farmer’s production and income and submit immediately the project proposals to the central office for funding. Meanwhile, Badilla likewise acknowledged the partnership that has been established between DAR and the Rights, the non-government organization assisting these farmers, which resulted to their installation. CAMP LUKBAN, Catbalogan City – On March 30, 2017, a day after the 48th NPA Founding Anniversary, a series of attacks was perpetrated by communist terrorists in different military detachments as part of their offensive operation against government forces. Among these is the NPA attack on the Geparayan CAA Detachment located at Brgy. Geparayan, Silvino Lobos, Northern Samar. More or less 150 NPAs attacked the detachment which is surrounded by the community of the Brgy. Geparayan which resulted to the casualty of four civilians, namely, Genalyn C. Tulin, 31 y/o; Jocelyn Tulin, 12 y/o; Danica Tulin, 10 y/o and Ruby Jane Tulin, 2 y/o, burning of the detachment, and the loss of one (1) M60; one (1) R4A3; four (4) carbine rifles; five (5) garand rifles and one (1) Harris handheld radio. The atrocity proved once again that the NPA is no longer concern for the well-being of civilians who are considered non-combatants and a clear manifestation that the communist terrorists do not abide to the Human Rights, International Humanitarian Law and Rule of Law. To achieve lasting peace and development, your Army in Eastern Visayas is calling the stakeholders and the general public to support the government forces in fighting these communist terrorists. Everyone is highly encouraged to report to any nearest military units any NPA sightings in their area. Despite this unfortunate incident, rest assured that the 8ID will continuously conduct massive combat operation to deter the evil plans of the NPA and other lawless elements against our peace-loving people in Eastern Visayas. QUEZON CITY – Consumer group People Opposed to unWarranted Electricity Rates (POWER) today slammed the Energy Regulatory Commission (ERC) for allowing the Power Sector Assets and Liabilities Management Corporation (PSALM) to continue charging electricity consumers with a 19 centavo/kWh universal charge to pay for its stranded contract costs. In an order dated March 6 but released only on March 27, the ERC indefinitely extended PSALM's P0.1938/kWh universal charge originally allowed from April 2013 to February 2017. The charge was supposed to cover PSALM's stranded contract costs of P53.851 billion incurred from 2007-2010. But the ERC said PSALM was only able to collect P48 billion by February 2017, thus it should be allowed to charge consumers P5.5 billion more in the coming months. "The amount might seem small, but they have been charging this to millions of consumers for the last four years, translating to billions already. With ERC's action, consumers will most likely be paying even more for the next nine years. They're killing us softly," said POWER Convenor and former Bayan Muna Rep. Teddy Casiño. PSALM's stranded costs are due to the onerous "take or pay" provisions in NAPOCOR's contracts with Independent Power Producers (IPPs) which allowed IPPs to charge NAPOCOR even for unused power. It is similar to the much-hated "power purchase adjustment (PPA)" that was abolished under the Arroyo administration. Most of the contracts were signed during the Ramos administration but was continued by succeeding governments, resulting in huge stranded contract costs. Due to strong opposition to the passing on of such costs to consumers, it was only in 2013 that PSALM was able to get ERC approval. But said charge was supposed to have ended last February. By extending the 19-centavo universal charge, POWER says the ERC is setting a bad precedent for PSALM to charge additional stranded contract costs covering the years after 2010, including stranded debts estimated at P245 billion. At present, PSALM has pending applications in the ERC to pass on P35 billion in stranded debts and P70.12 billion in stranded contract costs to electricity consumers. This will be reflected in monthly power bills for the next nine years, at least. “Electricity consumers are being made to suffer the consequences of NAPOCOR and PSALM's bad decisions. The original debt to be passed on to consumers was only P255 billion in 2001 as mandated by the Electric Power Industry Reform Act (EPIRA). This was supposed to be covered by the sale of NAPOCOR's assets. But the reverse happened and PSALM was left with an even bigger debt plus stranded contract costs. Why should our people suffer for PSALM's incompetence? This is unjust and cruel, considering we already have the highest power rates in Asia!" said Casiño. Last January, Energy Secretary Alfonso Cusi announced that the Malampaya Fund would be used instead to cover PSALM's stranded debts and stranded contract costs so as not to burden consumers. 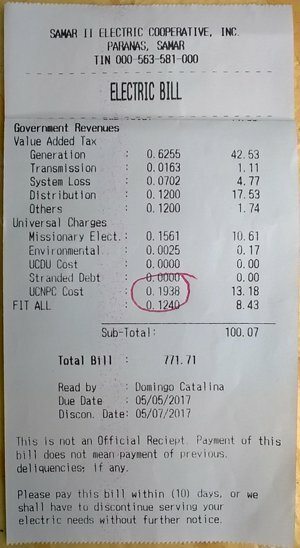 "So why is the ERC now allowing PSALM to continue charging consumers for something that the government already said it would shoulder?" asked Casiño. Casiño called on Congress to investigate ERC's actions and said POWER was studying options to file with ERC or the Courts to put a stop to PSALM's charging of its stranded debts and costs to consumers. MANILA – The Bureau of Jail Management and Penology (BJMP), with the support of the International Committee of the Red Cross (ICRC), launched an electronic learning platform as part of its jail decongestion initiatives. The Electronic Paralegal Learning Module (EPLM) is an interactive offline learning platform containing basic legal modules and resources. It aims to support jail paralegals’ continuing education and give them an electronic resource center for timely interventions to detainees. The EPLM is distributed in USB sticks that users can easily plug and play on their computers even without internet connection. The EPLM will benefit more than 400 BJMP paralegal officers nationwide. This will help them monitor the cases of detainees undergoing trial, and coordinate with criminal justice stakeholders such as public attorneys, law enforcement, court staff and judges, among others. “We developed this learning platform based on the challenges faced by our paralegals, which include lack of training and varying availability of resource materials in jails. By ensuring that our paralegals have all the necessary tools and resources, we will be able to capacitate them so they can help us process the inmates’ cases and decongest our jails,” said Jail Director Serafin Barretto Jr., BJMP chief. The learning platform ensures paralegals in all BJMP jails access to topics such as criminal procedure, modes of early release, time allowances, alternative dispute resolution, rights of the accused, international standards, and negotiation with justice stakeholders. In addition, the EPLM provides paralegals access to national laws, BJMP manuals, paralegal manuals and examples of written interventions that would help them facilitate timely and meaningful assistance to detainees. The EPLM was pilot tested in 15 BJMP jails in Regions 3 and 4-A, involving 22 paralegals. It will be available in all BJMP jails nationwide in April 2017. The ICRC, a neutral, impartial and independent humanitarian organization, has been visiting places of detention in the Philippines after World War II. It supports the BJMP in its efforts to improve the conditions of detention and the treatment of detainees. For the past 10 years, the ICRC has been assisting the BJMP in projects aimed at providing relief to the endemic national jail congestion rate averaging at 555% as of February 2017. Jail paralegals are essential to the BJMP’s initiatives to ease the congestion of jails in the country.